Business checks are pretty boring, but now you can add some style and elegance to your company's financial transactions. These eye-catching, premium laser checks feature a fleur-de-lis and diamond pattern that gives them a unique look while remaining professional. Whether the fleur-de-lis has a direct connection to your own business or heritage, or you simply appreciate the history and heraldry associated with this symbol - it's a classy choice! 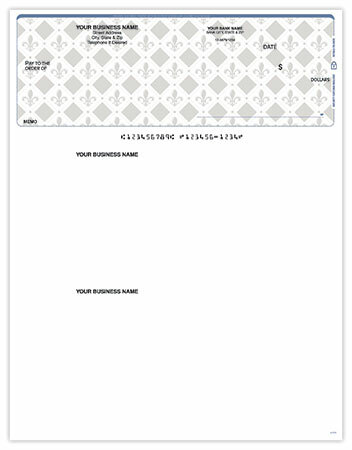 This design is available on our most popular business check product - the Top Check for QuickBooks and Quicken software. 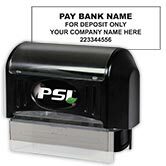 There is space for two vouchers making them ideal for payroll or general disbursement. Plus, get your checks printed how you need them by selecting options including reverse collate, standard lines and two signature lines. 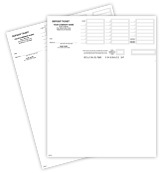 Order your Fleur de Lis QuickBooks and Quicken Top checks today!